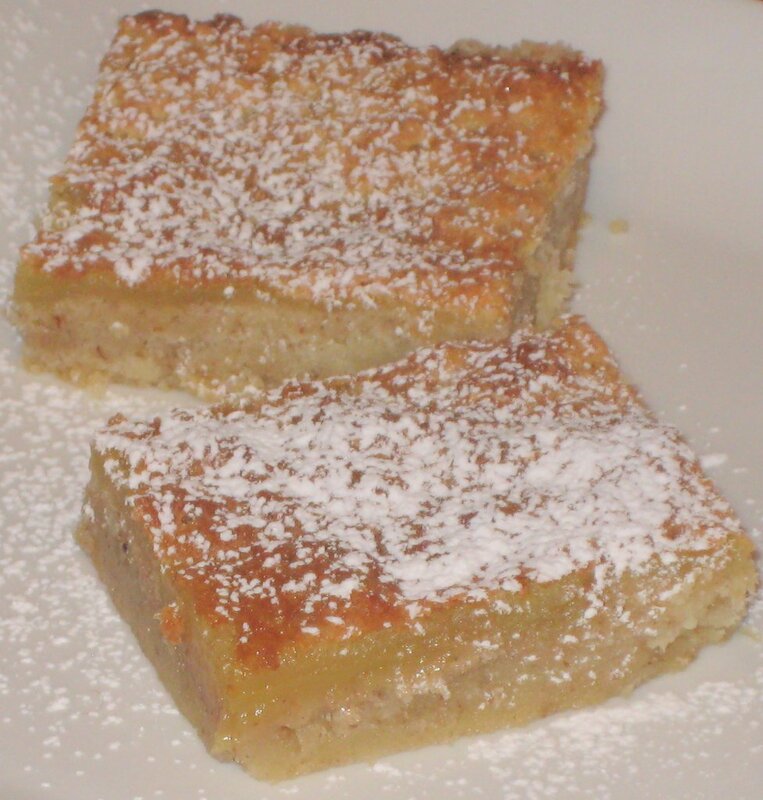 The traditional Lemon Shortbread Squares recipe is a favorite at my house. You can try using flavors other than lemon. Change it out for orange, or do a lemon, lime and coconut. I’ve created a Maple Pecan Shortbread Square that is also yummy. If course I use all organic ingredients. Make sure you wash those lemons before you zest them. Spray a 13x9x2″ baking dish with cooking spray. Preheat the oven to 350°F/180°C/Gas Mark 4. Sift flour, baking powder and salt in a medium bowl and set aside. Cream the butter and powdered sugar in a large bowl with a mixer set at medium speed. Turn the mixer to low speed and gradually add the flour mixture. Beat just until mixture is throughly combined. Press the dough into the prepared pan as evenly as you can and bake for 10 minutes. While the Shortbread is cooking prepare the filling. In a large bowl combine the eggs and sugar and beat well. Add the lemon juice and zest and continue beating. Add the flour and beat until fluffy. Pour this mixture over the baked crust and return to the oven. Tilt your dish or use a spatula to get it even across the shortbread. Bake for 30 minutes until light brown and crusty. Cool completely. Make 4 equally spaced cuts on the short direction and 6 equally spaced cuts on the long direction. This will be 24 squares approximately 2 inches each. Sprinkle generously with powdered sugar and serve. Copyright 2019 by No Shortcuts.